Heather McCollum » Siren’s Song Wins Readers’ Crown! Siren’s Song Wins Readers’ Crown! I’m thrilled to announce that SIREN’S SONG: Book One of the Guardians’ Series Won the 2015 Rom Con Readers’ Crown in YA Romance! Woot! I’m floating on my happy bubble. Thank you to all my fabulous readers! You really make writing thousands and thousands of words so much more fun! 2015 Winner in YA Romance! Oct 03, 2018: A New Highland Romance Series! 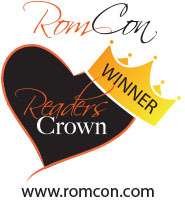 Jun 17, 2015: Siren’s Song Wins Readers’ Crown! Mar 25, 2014: Siren’s Song Releases! Feb 13, 2014: Siren’s Song Book Trailer Goes Live! Jan 28, 2014: TANGLED HEARTS Releases 1/28! © 2013-2019 Heather McCollum. All rights reserved.